As an agile coach and consultant I have heard most things around over the years when it comes to the “right” approach to implementing “agile” into organisations or teams. “Start with Scrum” is probably the most used one – also mentioned by me I suppose a number of times. However, this has started to sound a bit squeaky in my ears lately. In the beginning I couldn’t really put my finger on why it annoyed me so much. What’s not to like about Scrum if you want to take your organisation or team into agility? You have short iterations, low time-to-market cycles, reduced number of meetings and your development cycle is closer connected with your core business. Looking in retrospect on what I’ve learned over the years, I think I finally found my answer. Most of the value you generate comes from mindset/culture. Not from practices, tools and frameworks. Michael Sohato once (not too long ago) said, that “If you adopt agile practices you could see a 20% benefit. If you adopt an agile mindset you could see 300% benefit!” So many people I meet that are interested in agile for their organisation just want the benefits but without the mindset shifts needed to get there. Changing the mindset of an organisation is quite difficult – implementing a tool or a framework is easier to sell since this does not change the way people act or behave in general. It leaves room for the “we usually do…” or “this will probably blow over in a couple of months so I’ll just sit tight and wait for it…“. I love the Scrum framework. I really do! The agile manifesto and the simplicity in managing difficult task appealed to me. I changed my career after reading the agile manifesto and reading my first introduction to agile. But come to think about it, Scrum is very 80es. Agile taught us to evolve and develop and the one thing that didn’t develop as fast as the rest of the industry was, well you guessed it… Scrum. Scrum was a response to waterfall and it was huge leap in the right direction away from fixed cost/scope/timeline projects. But we need to embrace the great “unknown” ahead of us. Ron Jeffries, one of the great original thought leaders in agile even said “I may have invented points. If I did, I’m sorry now.” The point is, we need to inspect and adapt as technology changes, culture changes, and people change. When you think of Scrum you can think of it as training wheels on a bike. You learn how to move forward and steer, but it does not teach you the most valuable lesson of them all – to keep balance. Balance is what make riding a bike difficult and the training wheels will hinder you in this learning. Here’s a photo of my oldest son, Tristan, who is giving Scrum a go. 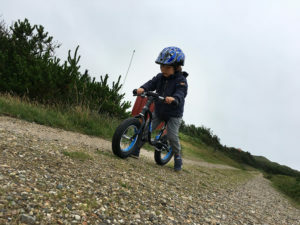 Though he understands the basic of how the bike is intended to work, he haven’t recognised the fact that both the bike and the helmet is out of his league. Most often the organisations that I’m consulting is also out of their league when it comes to understanding the proportions of their transformation. But there’s two options from here if we want Tristan to succeed. 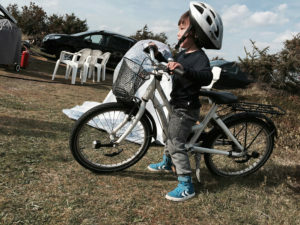 We can wait for Tristan to grow into a size and mindset where he can fit the bike and helmet – OR – we can adapt the bike and helmet. Here Tristan is learning how to find balance an d adapt to the idea of riding a bike. Being the agile father I am, Tristan never got to use training wheels. Why learn something so that you later can unlearn, right? With the adaption of finding the balance, Tristan managed to learn how to ride a bike. Much in the same way, the organisations and teams will learn how to adapt to the balance (read: mindset) that is needed in order for them to become agile. In conclusion, starting with Scrum may not be the right strategy for your organisation or team. My personal guidance as an agile coach now is to only start with Scrum if you envision something close to Scrum being your destination. And even if that is your situation, always start with trying to adopt an agile mindset before trying to implement a framework.